Any powerbanks that allow draining and charging at the same time? I just saw Anker post on Facebook with a Q&A about charging phones, and they comment that it is a myth that you shouldn't use your phone while it is plugged into a charger, that modern batteries handle that just fine. So do any Anker powerbanks allow you to charge them at the same that they're delivering power to their USB ports? Make for a fantastic UPS for microcomputers/microcontrollers like a Raspberry Pi or Arduino. I've tried with a Powercore+ Mini and a Powercore 10400 but they both shut down their USB ports when you attach the charging cable. Passive charging or pass-thru is how I have heard what you describe. So firstly, the electronics are far smarter than you give credit for. A phone does not charge its battery then use its battery to power itself. It does far more complicated functions, such as power itself and any excess unused it hands to its battery. It monitors temperature and throttles recharge or its own function to keep inside a reasonable temperature. So your claimed myth is not valid in general, because if you use your phone while charging, the thermal output of using the phone will cause the phone to eventually throttle its battery recharge, just due to minimizing heat. That heat can if not concerned about by the phone, result in a too-hot phone in your hand, or the heat ages everything inside particularly the battery. So its not true you should not use use the phone while charging, more that recharging will make your experience slower. Powerbanks such as from Anker in general do not do passive charging because it is singularly focused on performance and battery protection. The electronics of passing charging are larger and more expensive. 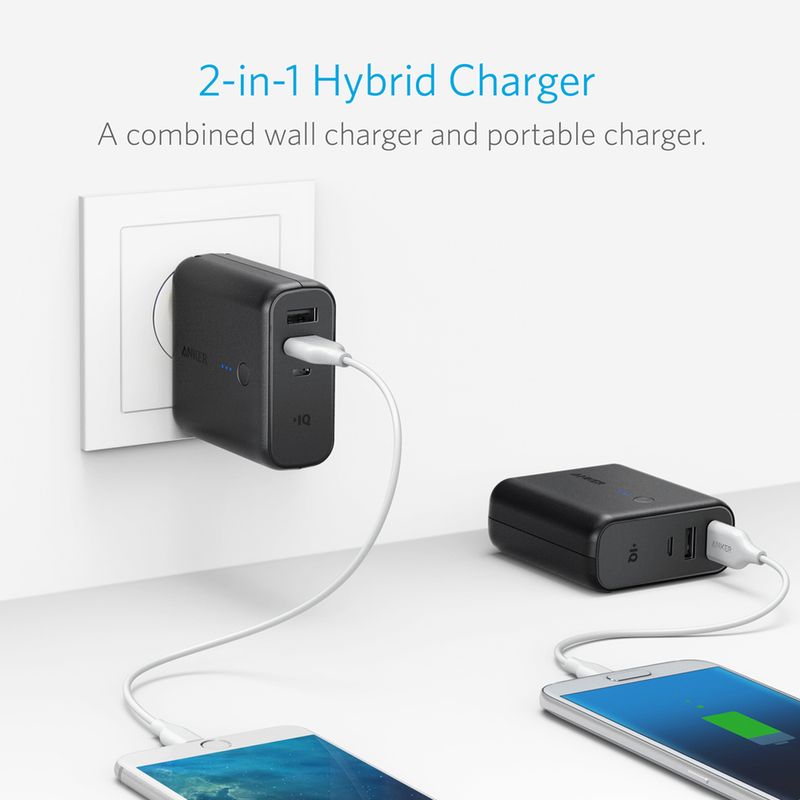 The nearest equivalent to what you ask for is the Anker Powercore Fusion. It focuses on output to your phone and when the phone stops asking for power (it is charged) then it focuses on recharging itself. @nigelhealy is correct. Most of Anker's power banks do not support "pass-through" charging as the demands of both charging the battery AND providing power to the connected device stresses the battery and shortens its lifespan. You'll find this to be true with other brands of power banks as well. The exception would be the Anker PowerCore Fusion as @nigelhealy noted since it is designed specifically for this purpose. Hmmmm I don't see why not because their own post says it's a myth. You can use the phone while charging. It makes the phone run slower due to thermal throttling. Some phones, such as OnePlus3T have more of the charging electronics external to phone so less heat so less throttling. I often use my phone while plugged in, in fact I prefer to do that while travelling such as sat in aircraft seat, because it is more efficient use of the finite portable power bank. Well, for the record, the Fusion is not the solution. Bought one. It powers down after 30 minutes while plugged into a socket, probably because the Raspberry Pi doesn't draw enough power to keep its interest up. My "claimed myth" was directly off an Anker post, as I said. Please take that up with Anker, not with me. The act of using a phone whilst it is charging has nothing to do with the battery directly, only indirectly with the heat causing throttling. So Anker's words are kind-a-right in the outcome is valid but the cause is not. "PowerCore comes pre charged to 50% and it is recommended to fully discharge and recharge at every 4-5 months to maintain the lifespan of the internal batteries." 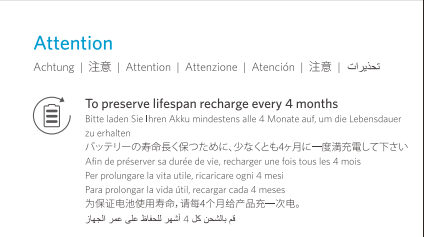 This is completely, and utterly false when it comes to Li-ion batteries"
So basically one part of Anker says never fully discharge/recharge, another says you should every months (but no often as it ages faster). What I do is follow the instruction manual, its probably been better peered reviewed. I do store certain batteries about 50% charge (as best as I can tell from the lights) which are the ones I travel with, others I keep for unexpected emergencies I just store fully charged, and pile up a collection of such over the years. This is possible, but the effects on the battery life are detrimental. Thermal management of a battery pack that can charge and discharge at the same time without increasing its size is difficult. There are manufacturers like RAVPower and Limefuel that offer these capabilities but I would not count on using that feature too often unless you want to deteriorate the battery. This might just be a choice of words, but when you say charge and discharge battery, I separate what you hold in your hand into two aspects, so not disagreeing but expanding the problem. Inside a USB powerbank is electronics and chemical energy storage substance "battery". When you use a powerbank to recharge the battery, the electronics are producing a progressively higher voltage and lower current to the chemical energy store. When you use the powerbank as output, electronics take the energy out and progressively step up the voltage output as the chemical energy lowers its voltage. It would not be the battery which charges and discharges concurrently. There is a mains power (110V/240V) electronics which can give the battery just what it needs and no more, with whatever energy is left after servicing the USB output, which is a more complicated role for electronics to juggle both concurrently than serving one role at a time. Analogy, you have some food you just bought, you feed the family what they want til full, then put the rest in the fridge to store for another time. Regardless how hungry is the family, you are not putting more stress on the fridge. This is about electronics, not batteries, or about how smart you are knowing the family is full and its time to open the fridge door. Because more intelligent electronics increases the design and manufacturing cost, it increases the cost of the powerbank with the capability. No electronics is 100% efficient, I see figures of 80%-95% so there is heat of doing anything, so if you had both electronics to produce the constant 5V USB output and the steadily increasing voltage (say from 3.2V to 4.2V) of the chemical energy store, this increases the total heat inside the packaging. Given the chemical energy store oxidizes and loses capacity faster when exposed to higher temperatures, you will either need a bigger device, or active cooling (fan) or accept more device failures / accelerated aging. I side with Anker on this because it lowers the costs, and keeps the sizes smaller. I tend to be perfectly happy with a dual USB socket Powerport and a Powercore and I plug the Powerport and Powercore together, this separates the heat. The Powercore Fusion is the 1st of the kind from Anker with the electronics to do both, but observe it is only 5000mah, rather large and a higher cost for its capability, only 10.5W. There are youtube tutorials on the electronics associated with step-down voltage and step-up voltages, it isn't that complicated, but you can soon appreciate the challenges with a hybrid product. I do expect Anker will learn lessons, and possibly with the IQ 2 being more efficient, that a better Fusion will emerge at some point. You're right. That's what's actually happening but in layman's terms I would say charge the battery pack as well as charge your phone from it. But it's actually the electronics inside that are managing the charging of the pack and the phone. The pack isn't actually being worked two ways (charged and discharged) - my bad. 1)Anker never compromises on the quality, efficiency and security of our gadgets and the powerbank itself. 2)Anker already equipped its powerbanks with max security and efficiency that no other company can offer in the same price. 3)Technically (if you search on Battery University and radiation related links) its harmful for the Tricia (user, phone and the power bank) if electronics are used while charging (especially cellphones). Even in the case of "pass through" option available, the cellphones and the users may effect negatively if used while on charging. So your claimed myth is not valid in general, because if you use your phone while charging, the thermal output of using the phone will cause the phone to eventually throttle its battery recharge, just due to minimizing heat. That's not true in all cases. My simple phone doesn't have heat problems when charging and using with full brightness screen. But honestly demands to say it only draws 1.2A or similar. Phones that draw more power will generate heat. But that's only true for QC technology. OnePlus uses DashCharge tech and that doesn't heat up your phone at all, while still pumping 4A to the phone. The reason is this: The battery is a phone is 3.7v. The usual power delivery is at 5v, or much higher in case of QC. That means conversion. Conversion means loss. Loss means heat. DashCharge delivers the right voltage, so far less heat in the phone. I wish Anker supported Dashcharge because all those conversions don't only generate heat due to losses, but those losses also mean you can't get as much power out of a powerbank as is theoretically possible. Although this is an old post, there is now a product that can actually do this. It is the PowerCore Fusion and it is designed for this function. Generally, however, power banks should not be charged and used for charging at the same time for a simple reason, doing so generally results in the battery being inline (or in series) with the phone, causing a higher power draw and excessive heating (basically the battery has to withstand the current charging it plus the current charging your phone). A simple solution to this problem is to restrict the phone charging while charging the battery. A more complex solution is to split the two power paths, but this adds cost, weight and size. I happened across this topic with what appears to be the same interests of the OP. That is, I am interested in providing USB power to a device that doesn't have a battery, such as a Raspberry Pi or Arduino. For the purposes of powering these devices when portable, USB power banks are a very frequently used solution. The problem is that the device, unlike a phone, cannot continue running when switching between USB power sources, which is exactly what happens when disconnecting from a USB power bank and an AC adapter. Phones, which have their own batteries, will continue running when transitioning between drawing on their batteries and charging from an external source. Because a Raspberry Pi does not have its own battery, the desire is to have a USB power bank that can provide power both when the only power is its battery, and when charging, and ideally, there will be no loss of power when transitioning between the two. This is being called "pass-through" or "passive charging" in this thread. The PowerCore Fusion is an interesting device, but it doesn't fit the need of many Raspberry Pi users. I guess that means that there aren't an Anker products that fit the bill, though it's a feature that would be welcomed by many for future products. There are some assumptions here about what is being requested that miss the point of the mechanisms that are used for most pass-through solutions. A power bank that provides pass-through does not necessarily mean a power bank that both charges its own battery while simultaneously discharges its battery to provide power to connected devices. What is usually the case for this situation is that there is separate circuitry in the power bank is used to (1) charge the internal battery, and (2) provide power to the connected devices. When the circuitry that provides power to connected devices is only designed to draw from the batteries, then pass-through is not possible. On the other hand, circuitry that can switch between pulling from the same power source as the charging circuit and from the battery is capable of pass-through. There are a number of cheaper USB power banks that are designed to do just this. However, when a switch occurs between external and battery power, a brief loss of power, as delivered to connected devices, can occur. The solution to this is to use a capacitor that is adequately sized for the switching delay and promised output current. The longer the delay in switching, the larger the capacitor; the greater the promised output current, the larger the capacitor. A power bank that only claim to deliver a single 2.4A (5V) device and a very brief switch would require less of a capacitor than a power bank that has 3 2.4A ports, even with the same switching capacity. Another other issue is that the external power source is not being used to power both connected devices and charge the battery. If the connected device requires nearly all of the power capable of being provided by the external source -- which is true if using a 2.4A external source and a device like a Raspberry Pi 3B+ running at even half power -- there's no power left to charge the battery. This is likely why Anker has stayed away from this type of device. Still, I'd love to see something geared towards this kind of use case. Because people interested in this use case are up for non-traditional solutions, it would be neat to see a power bank that could be connected to external power other than an either an AC outlet or another USB source. By that, I mean having the option to pull power from a high current DC source, at something like 5, 12, or even 48V. Examples of alternate sources that fit this description include automobile electrical systems and PV solar arrays. Each of these are often capable of providing more than enough current for both charging even a large bank of lithium ion cells and providing peak current to several USB devices. However, both automobile power systems and PV solar arrays are capable of losing power at any point, so getting USB power from only the power bank is ideal. The Anker power bank I frequently use contains 6 18650 cells, which are capable of peak charging at several amps, but I charge the device with USB power, which leads to really long charge times, compared to the time it would take to fully and safely charge the battery. A power bank that could charge from a high current DC source would be convenient for both regular charging and for pass-through solutions.